Combine mayonnaise, garlic, lemon zest and juice in a small bowl and add salt and pepper to taste. Chill in the refrigerator while frying the artichokes. Whisk egg and milk in a small bowl. Combine Parmesan and breadcrumbs and place in another small bowl. Dip artichoke in egg mixture coating well, then dip in breadcrumb mixture. Fry artichokes for 2-3 minutes or until golden brown. Remove artichokes from skillet and place on a paper towel to drain the excess oil. Sprinkle with additional Parmesan cheese. Serve immediately with lemon garlic dipping sauce. Fried artichokes are one of my favorite appetizers at the restaurant that my family and I eat at often. Last time we were there I paid detailed attention to the flavors and details of the dish so that I could try to replicate it on my own at home. These Fried Artichokes with Lemon Garlic Sauce tasted just like the ones at the fancy restaurant but made at a fraction of the cost. Start off with canned and quartered artichokes – no meticulous chopping here. 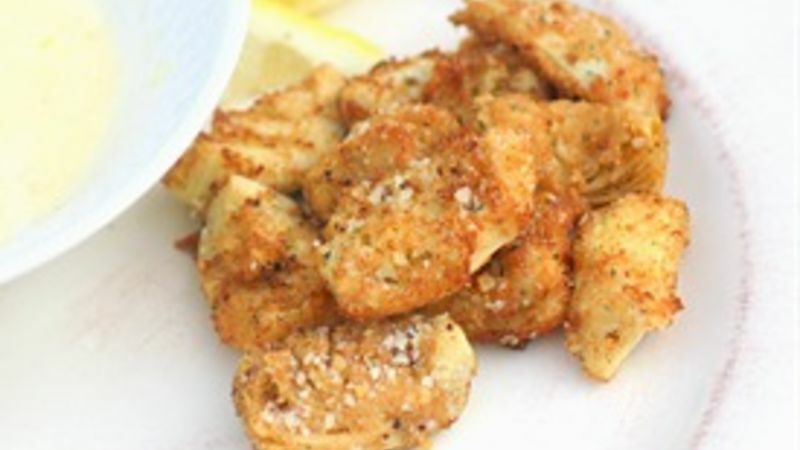 The artichokes are dipped in an egg mixture, coated in a Parmesan breadcrumb crust, and then fried for a few minutes to get them nice and crispy. A quick light lemon garlic sauce is the perfect compliment to dip them in. I have eaten artichokes boiled and steamed, in dips and salads; heck, I even have fake artichokes in my flower arrangements around my kitchen. But until recently I hadn’t discovered that my favorite way to eat an artichoke is fried. I was thrilled to discover that frying the artichokes actually brings out their sweetness. These Fried Artichokes definitely aren’t your typical appetizer but are unique and tasty. They are a quick and easy appetizer to whip up for your friends or family.